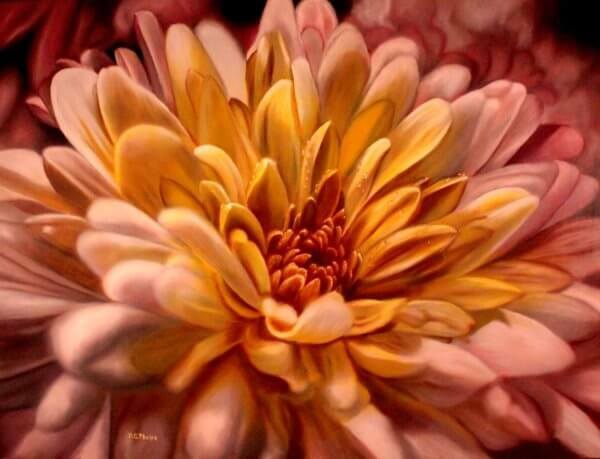 Paintings of flowers, my 10 best and some other great examples. 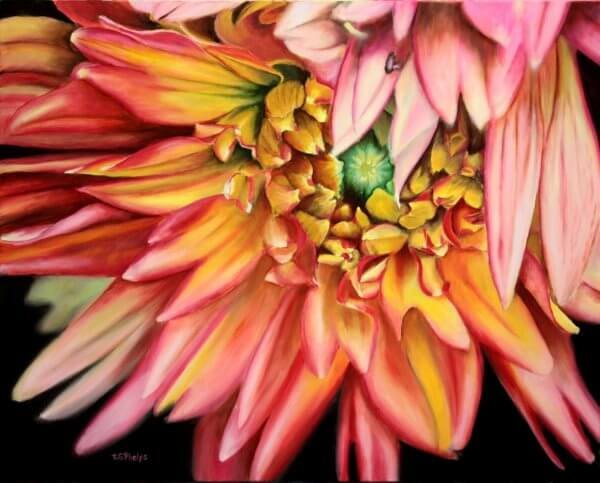 Paintings of flowers! My 10 best, and well, a few more. I just can't help it. When an image makes my heart sing, I have to pass it on! It would be a discrace and a shame to hide these in some dusty attic hidden from the public eye. So without delay, below are a sampling of flowers that have come from the garden, a florist, or a kind friend that knew I would fall for them. They are studied and positioned just right to give you, the viewer, the best angle to appreciate their glory. The lighting is positioned just so for the same effect. Then in some cases, a bit of dew is placed strategically to offer what I call "bling" in my paintings. Granted, I did say 10, but I simply can't choose the best 10, so I offer a few more! Some of these paintings are still for sale, and some have been in exceptional homes for years. Those that are available have links near them to my fine art site! I've also categorized them in groups for you. Enjoy! This painting is available on my fine art site. 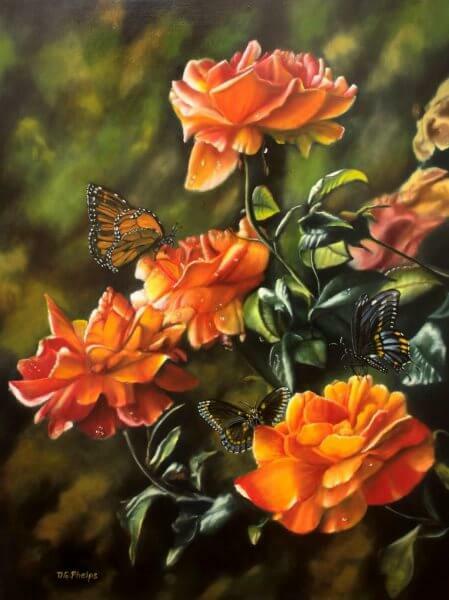 Paintings of Flowers, the Roses kind of flowers, the worlds most popular flower! 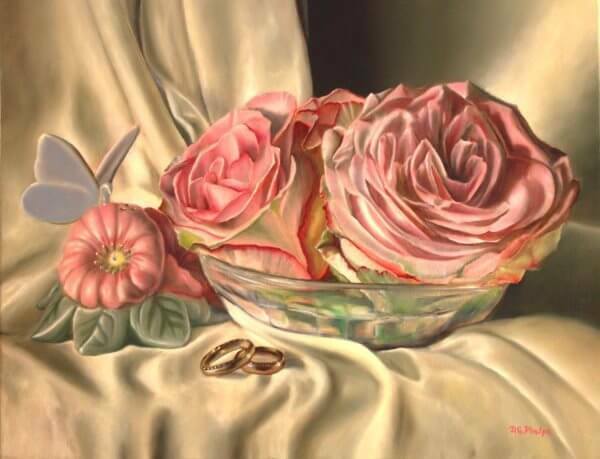 Ring and Roses, a depiction of pink roses in a crystal bowl and two wedding bands celebrating marriage and the circles of forever love. The single red rose, quite a bit of meaning behind this. 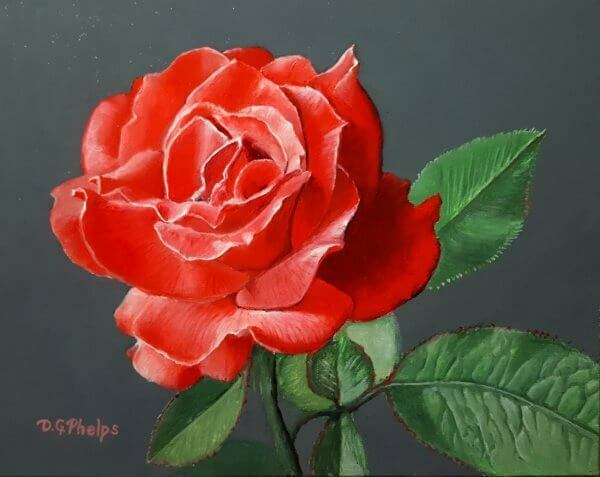 Check out my fine art site for a short video on its creation and the true meaning behind when you give a single red rose! Available on my fine art site. The yellow rose holds a special place for close friends. These three blossoms were the last before tent caterpillars found the bush. Then our deer herd and Japanese beetles ate them to the ground. There's a nice story behind these on my fine art site. Here's a little demonstration of a Dahlia done awhile back! The painting sold, however, it gives you an idea of what can be created for you! 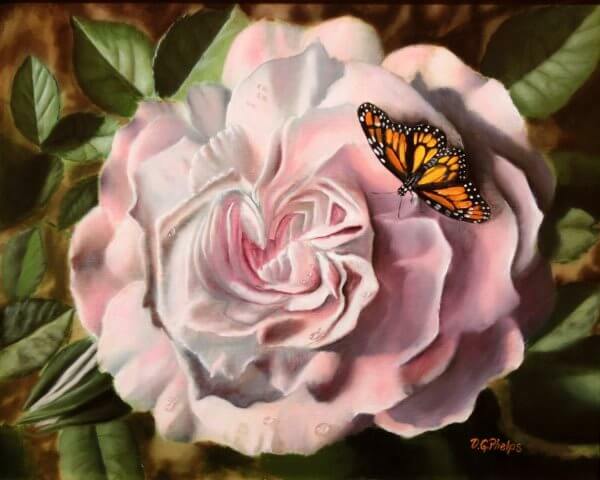 Paintings of flowers and why they make you happy! Let me ask you this. Please indulge me for just a few moments. When you clicked into the site, did you note your mood? You may not have been readily aware of it, but take moment and think about it. 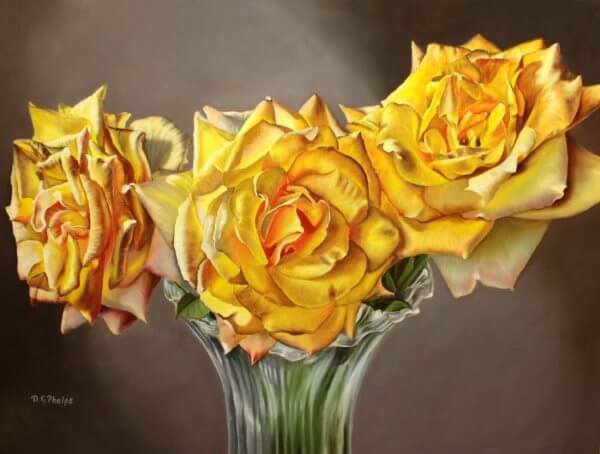 After viewing these paintings of flowers, did your mood change? Science says it probably did. 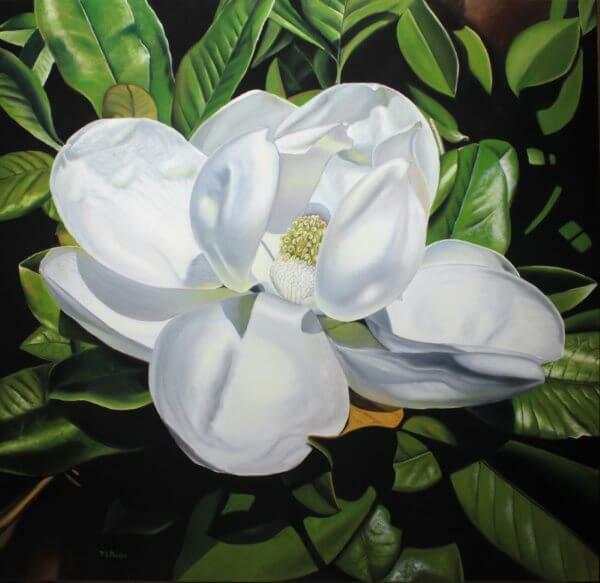 There is quite a bit of research both on the effects of art, and the effects of flowers in particular to our health. And not just mental health, but physical well being! 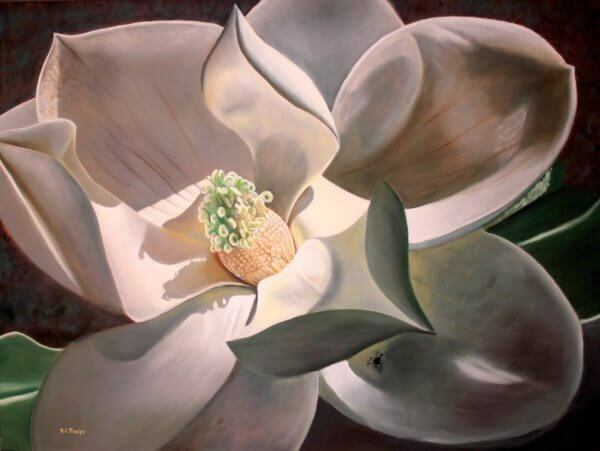 Without boring you to death with all the doctor speak, (I'll leave my references to the studies below so you can emplore these in more detail), Art and Flowers actually improve your health. 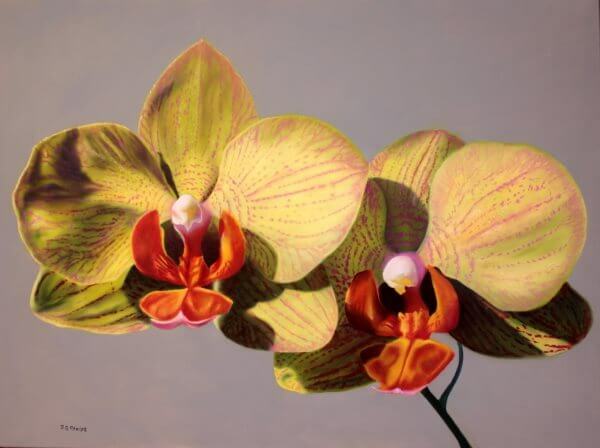 In just the act of viewing these paintings you are significantly reducing stress and anxiety. You are increasing positive emotions. Flowers have an immediate impact on happiness. The funniest part of the research! I laughed my head off when reading the part concerning immediate reactions. The Doctor stated that in their research, very few things give us a 100% reaction, very few. He went on to say, "when we drop a snake on a participant, we always get a 100% reaction of fear"! He goes on to explain when we show a person flowers, we get a 100% reaction in happiness, (a true smile, a genuine I am happy smile)! "Polite Smile: This is used most commonly in quick greetings or acknowledgements. No discernable facial movement is present except the turning up of the corners of the mouth." "True Smile: This is seen when there are possible changes in behavior indicating pleasure. Hence it is called “true” – the person is truly happy." If you took the next step and decided to actually produce some art on your own, you then increased your neural connectivity in the brains network for motor skills, introspection, and memory. 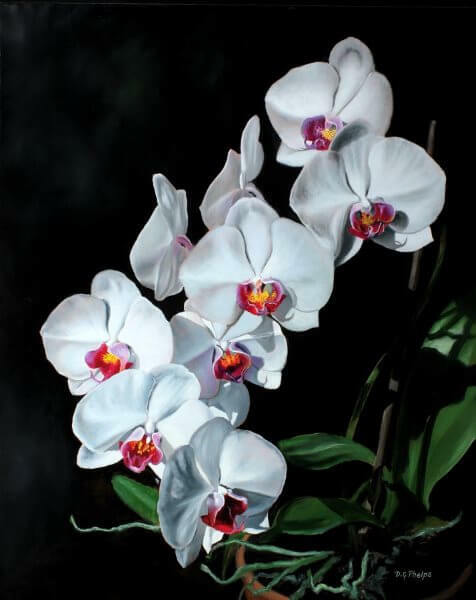 Paintings of flowers of the Moth Orchid kind. These are probably the most prolific orchids I have in the house. The yellow and just a touch of purple pink veins running through the blossoms are a sure winner. This is large canvas, a 30 x 40 incher framed out nicely with a brushed silver chrome low profile frame. I also have a short demo film on the fine art site. This painting is available. This is a very large piece measuring 36" wide by 48" tall. A painting with a soft impact. 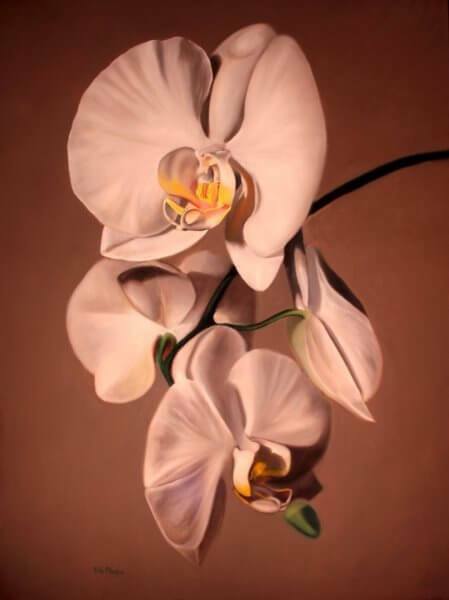 The modern meaning behind the white orchid is HOPE, and in todays topsy-tervy world, a painting representing hope is much needed. This painting is available here on my fine art site. 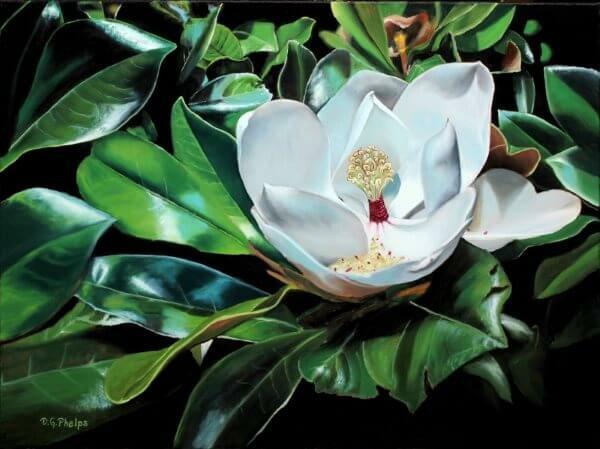 Magnolia paintings of flowers and blossoms. The struggles behind this piece were not to bad, I just had to use about a half dozen different reference photo's to get all the leaves exactly the way I wanted them. Its a sold piece however, if you have an interest on its creation, check it out here. A recent commission and subject of a demonstration here on the site using the Flemish technique of painting discussed in my eBook below. A gorgeous closeup of a southern favorite. They never cease to amaze me with their aroma! If you have a large tree, with multiple blossoms, you know what I mean. There's a wonderful story behind how I found this blossom and how the tiny jumping spider found me! Available here on my fine art site. The best benefit is when you create your own paintings of flowers! 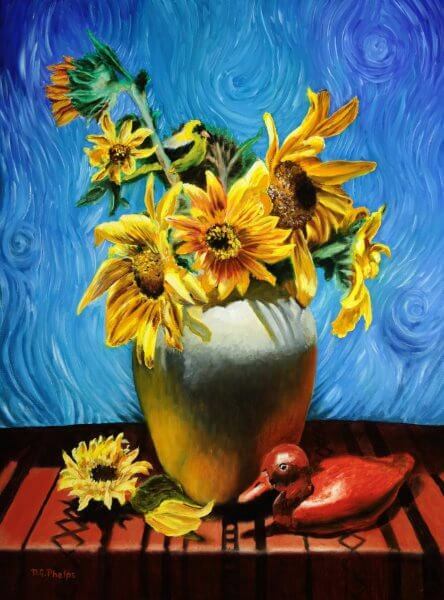 My recent go at a Van Gogh style sunflower arrangement. The impasto effects and the freedom to be a bit loose on this work was exhilarating! Also a short demonstration on this here on the site. Real Art Lesson PDF instruction manual in creating realistic oil paintings.